This recipe was on the cover of the Pasta February 2012 issue of Bon Appetit magazine. 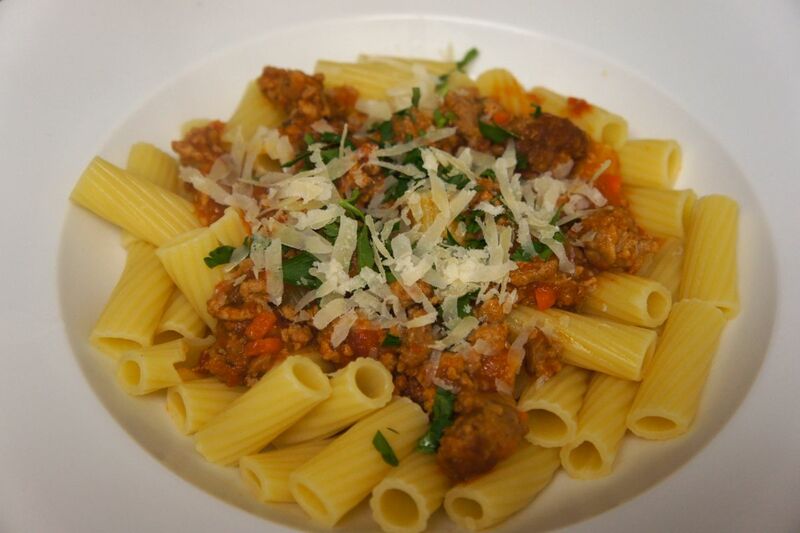 A soffritto of carrots, celery, onion, tomato paste forms the base of this ragu with Italian sausage and ground pork. The sauce is slowly simmered for four hours, making it a good Sunday afternoon project. However, I thought the deliciousness was in the good, not great range. It does not beat my previous favorite version of a spicy Italian sausage tomato sauce from Andrew Carmellini (Rigatoni Pugliese). At what point does one stop trying new versions of the same basic recipe and stick to what they know is really good? Link to Rigatoni Pugliese review here. 5 hours for pasta! (not including freshly made pasta)!